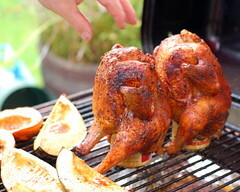 Beer can chicken - literally combining beer and BBQ. Thanks to Suup on Flickr for the photo. Here are just five of the things that I (currently) love most about beer. 1) Drinking beers while barbecuing. This is the one that prompted me to write this list. There is just nothing like hanging out and cracking a few beers while cooking some meat over a fire. I’ve barbecued four times in the past week (it’s beautiful weather! ), and I’ve taken full advantage of drinking some beers out on our porch. Usually, I want something familiar and refreshing while I grill; I don’t want to be bothered with analyzing/rating a new beer. I just want to sit back and relax. Tonight, it’s the Bridgeport Haymaker and Scuttlebutt IPA; mission accomplished. 2) IPAs. Yep, I love hops. Enough said. 3) Beer Travels. Not every trip is a “beer trip” (which I have taken plenty of), but every trip usually has time for a little beer exploration. Aside from a trip home to Chicago next month, our next trip is out to Washington D.C. and then up to Boston to visit Jeanne’s family/friends. I’m pumped because I’ve never really spent time in either city. We’ll have a lot going on (like going to my first game at Fenway) with general tourist stuff and visiting with family, but I’m more than certain we’ll be fitting in some beer stops. That makes me a happy man when I travel. 4) The beer geek community. Yeah, I know…sometimes beer geeks can be a bit much. But, I love that there are plenty of like-minded people out there that share my love of beer. It’s not uncommon for beer geeks to share glasses with strangers or pop open a rare bottle of something that cost them a pretty penny for a group of people. Most people are passionate about something, and we’re lucky enough to be passionate about something that tastes freaking awesome and gives you a buzz. 5) The Great American Beer Festival (GABF). The grandaddy of all beer festivals. There might be beer festivals that you might enjoy more because of smaller crowds, weather, location, etc…but there is just nothing like GABF. Like I said before, everyone has a hobby and this is essentially the annual consumer exhibition/trade show for the beer industry. People from all over the world converge on Denver each fall to get samples from breweries across the US. It’s mind-staggeringly huge. There are crazy amounts of people, yet you still seem to get around with no problems and sample pretty much everything you want. You meet people from all over the place. It’s just a freaking blast. If you’re a beer geek, it is something that you MUST do at least once in your life. But, everyone needs a break from it. After going for three consecutive years, I’m definitely sitting this year out. Well, that’s just five of my favorite things that come to mind. Let me know if I missed your favorite. Daughter Kelly (Munster Grad) and her husband currently live in Boston’s North End and are closing on a condo in Salem next month. We will be there at the end of June and stay thru July 4th (Boston fireworks on the Charles River are The Best. Plus there are several breweries and brewpubs nearby. Not as many big,bold, hoppy beers as we get in the NW. I think a man feels more like a man if he can enjoy a bottle of suds after a long days work. in dc hit the brickskeller (sure you know already) and i liked the Big Hunt last time i was there…good taps and a big board so i didn’t need to ask what the hell they had on their list. in boston, i’m not as up on the beer bars, but go to Redbones for 30+ taps and great BBQ. it’s in Davis Sq, not far from Harvard Sq, and has the best corn pudding ever!